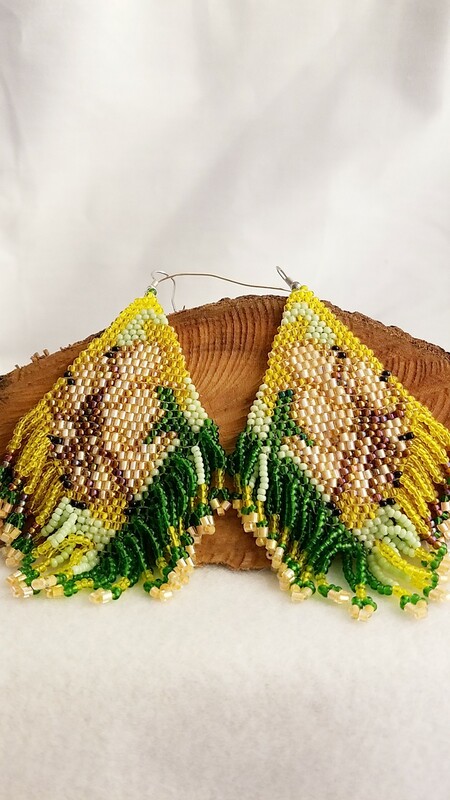 These Yellow Rose of Texas Woven Bead Earring are Divine and will have everyone oohing and aahing over them. These Yellow Rose of Texas Woven Bead Earring are Divine and will have everyone oohing and aahing over them. Hand woven glass bead by glass bead in the Yellow Rose of Texas pattern with care to make a splendid pair of earrings. Please note that these earrings are a bit on the heavy side as of how many beads were needed to make them. 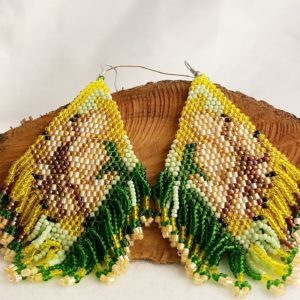 Beadwork-is the art or craft of attaching beads to one another by stringing them with a sewing needle or beading needle and thread or thin wire, or sewing them to cloth.Beads come in a variety of materials, shapes, and sizes. Beads are used to create jewelry or other articles of personal adornment; they are also used in wall hangings and sculpture and many other artworks. 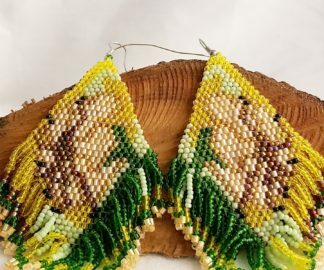 Beadwork techniques are broadly divided into the loom and off-loom weaving, stringing, bead embroidery, bead crochet, and bead knitting. If you would like to know more about the gemstones, rings, and items that are used in making handmade items like this, Yellow Rose of Texas Woven Bead Earring; please take a look at the Material Description Page and my Chain Maille Descriptions page.